Mi Mi- This song might be the next hit disco horah on the wedding scene. I have heard it is already being played and I can hear why. I tap my feet and fingers each time it plays and my kids request that I go back to that song every time they get into the car. Composed by Yoeli Dickman and arranged by Yanky Briskman the mix of real instruments and techno produce a real enjoyable and joyful song. Keracheim- In my opinion it’s the slow hartzige songs that separate a good singer from a great singer. Listen to this song and you’ll hear Simcha’s talent just shouting at you (no he’s not shouting at all…he is quite smooth actually). His power, sweetness and just jaw dropping range are on display in this amazingly beautiful song. Composed by Yochanan Shapiro, arranged by Yanky Briskman and with choirs by Zemiros (adult) and Shir V’shevach Boys Choir, this is one song guaranteed to mesmerize you each time you listen to it. Shebechol- Composer Yitzy Waldner is just a hit machine. This is just another one of his disco horas that will sweep you off your feet and get you onto the dance floor. The catchy chorus is one that keeps playing in my head over and over again. Pischi Li- The title track of this album is a song that I am not sure if there are adjectives to describe. Composed by Yochanan Gordon (a name I don’t recognize so it could be his first foray into the JM scene…and if it is please come back again) and arranged by Yanky Briskman, this song is hartzig, soulful and unbelievably beautiful. Hamelech- A lebedick rock song composed by Yitzy Waldner-check. Arranged by Yanky Briskman-check. Choir by Yochi-check. Simcha’s amazing singing-check. Anything else need to be said? I think not! Shomer- I might be repetitive (and yes it wouldn’t be the 1st or last time) but Yitzy Waldner has composed another beautiful hartzige song. This song, arranged by Israeli star Udi Damari, is melodious and really highlights Simcha’s voice. I really like Simcha singing in the background to end off the song. Eliyahu- Yitzy Waldner, v’hamayvin yavin (I mean what else can I say anymore). This disco horah is enhanced greatly by Yanky Briskaman’s innovative musical arrangements and the Zemiros Choir. It is another very enjoyable song on this album filled with enjoyable songs. Ono Hashem- Simcha is a talented composer in his own right and this song of his, the only one of his songs on this album, is one that is beautiful and full of feeling and haartz. There are reasons why I say no to my kids when they want me to repeat Mi Mi over again and this song is one of them! 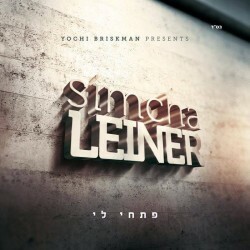 Simcha- How cute a song named Simcha on an album by Simcha! Ok I do have more to say about this song…and yes it’s a disco horah composed by Yitzy Waldner and arranged by Udi Damari. Personally it is not my favorite song on the album but it’s a fun song I enjoy listening to. V’ato- The last song on this amazing album is composed by renowned composer Elimelech Blumstein. It is a very interesting ballad that has a very unique key modulation from major to minor scale with some really amazing harmonies performed by Zemiros Choir and by Simcha himself. The ending of the song is really nice and shows off Simcha’s range. What a way to end off the album! In conclusion, there is a reason that this album is playing on repeat on my home computer (yes that’s how my kids listen to music in the house), work computer, and both cars. If you haven’t gone out and bought it yet what are you waiting for! It is available at http://www.mostlymusic.com/pischi-li.html or wherever good quality Jewish Music is sold!